By Nieves is an amazing company who creates natural, handmade body care products designed to pamper and indulge your skin in pure luxury. All of the products in this line are 100% natural, vegan and organic. Treat your skin to a little love by using By Nieves. You deserve it! I received samples of By Nieve's five top selling products, which are Face Fix, "C" Perfect Skin, The Balm, Bath Salt, and my favorite, Cloud of Protection Spray. 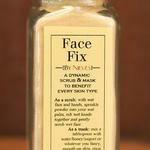 Face Fix is a gentle yet effective organic herb and clay powder facial scrub for every skin type. You can use it on damp skin to exfoliate dead skin cells, or you can mix it with a dab of honey or yogurt for a delightful, soothing facial mask. It purifies your skin. I use it twice a week and my skin absolutely glows. It removes oils and unclogs your pores. It is perfect for sensitive skin, as it has zero harmful ingredients or irritants. I absolutely adore Face Fix. It leaves my skin so soft and smooth. "C" Perfect Skin is a nutrient packed moisturizer/serum that Is made with Vitamin C and an Essential Oil blend designed to help with anti-aging and skin clarity. It helps reduce the appearance of aging, sun damage, dark spots and scarring, while protecting against further damage. Your skin will look and feel beautifully smooth, soft, moisturized and healthy. I love this 'magical potion.' I apply "C" Perfect Skin after I exfoliate, and before I put on my makeup for a flawless look. It makes my skin looked refreshed and radiant. 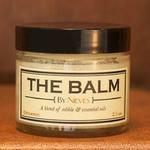 The Balm is an all purpose moisturizing balm that can be used to shine hair, soothe skin and soften your rough, dry areas, such as knees, elbows and heels. It is amazing for hair, to smooth flyaways, add texture and to even add a bit of spike, like I do to my little boy’s hair now and then. It works great! I use it on my legs after I shave. It also heals extremely chapped skin. My oldest son has eczema and has used it as an effective soothing balm. It really works. I think it should be called, "The miracle balm." 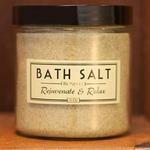 By Nieves’ Bath Salt is a blend of Sea Salt, Epsom Salt, Seaweed and Essential Oil. This detoxifying soak will leave you relaxed, refreshed and ready for whatever is next. Let yourself get lost in this wonderful bath salt, and emerge from your bath feeling peaceful and serene, and oh-so-soft! I never wanted to get out of my bath after I used By Nieves bath salt. It smells like heaven, too! Cloud of Protection is awesome! 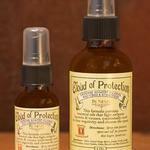 It is a spray made from essential oils that is designed to keep you safe from illness, bad vibes and nasty odors. Whenever I spray Cloud of Protection, my spirits are instantly boosted. I keep it in my purse and often find myself spraying it religiously. I also use it as a hand sanitizer. And, here is another unconventional use for it: It gets rid of dandruff! I know that sounds odd, but I had a few flakes in my hair and srayed my scalp with Cloud of Protection, and the dandruff has just about dissappeared. Wierd, huh? It is true! Great stuff!